After I finished my first game of Fantasy Flight Games latest Cthulhu boardgame, Eldritch Horror, I was certain of two things. First, it was the best Lovecraftian boardgame that I've ever seen, leaving earlier attempts (like Arkham Horror) in the dust. Second, I was now in the grips of a compulsion to paint a proper set of miniatures to match the characters in this excellent game. That's when I started obsessively collecting miniatures from Citadel's Gothic Horror range. 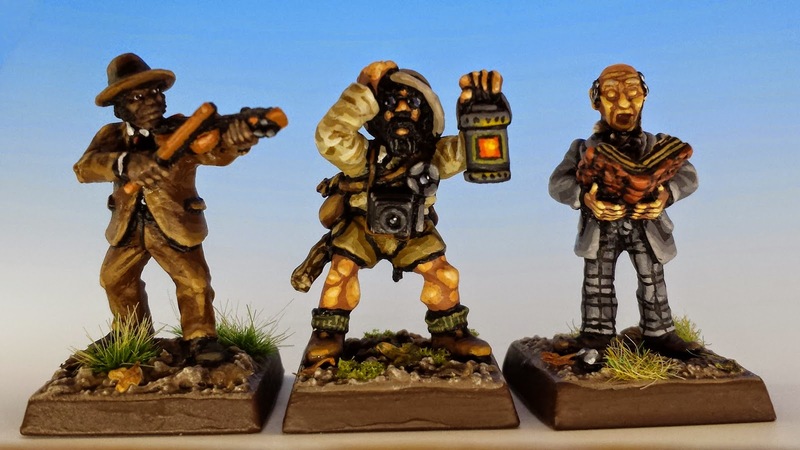 I love trawling through eBay and the Stuff of Legends, looking for the perfect miniature to capture in vintage lead the characters portrayed in a modern game. 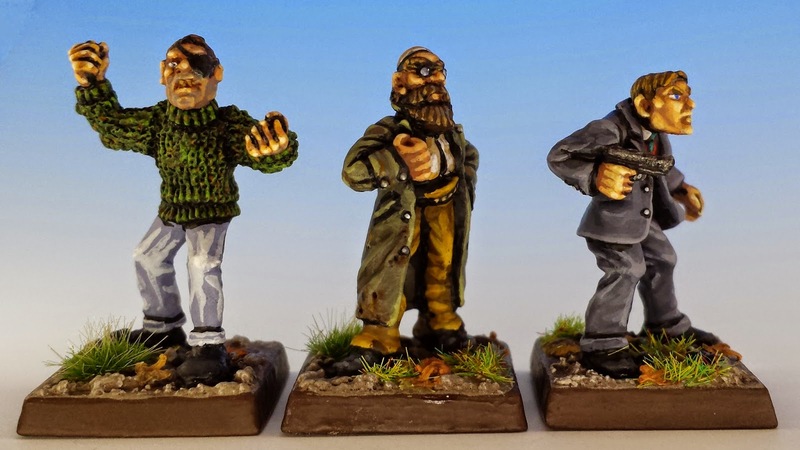 Below you can see the results: twelve miniatures representing characters for Eldritch Horror, juxtaposed to the illustrations from the game that inspired the minis' selection and colour scheme. Eldritch Horror is so successful because it doesn't merely throw a random collection of monsters at the heroes, but gives them a sense that they are dealing with a worldwide conspiracy. 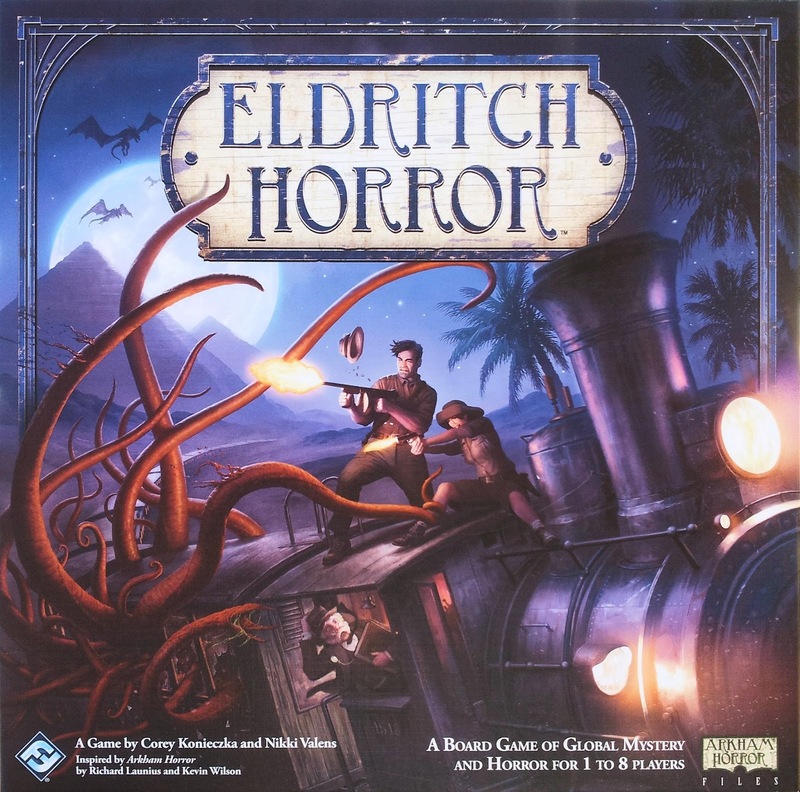 In fact, Eldritch Horror is the first boardgame that I've played that condenses many of the best elements of a Call of Cthulhu role-playing campaign into a single session lasting just a couple hours. Just like grand CoC adventures like The Masks of Nyarlothotep (1984) or Shadows of Yog-Sothoth (1982), the characters can travel across the globe searching for clues in remote jungles or exotic cities -- or they can stay put in New England, rambling through Arkham and researching forbidden spells. Playing the game, you have a delightfully Lovecraftian sense of having many choices, but few good options. 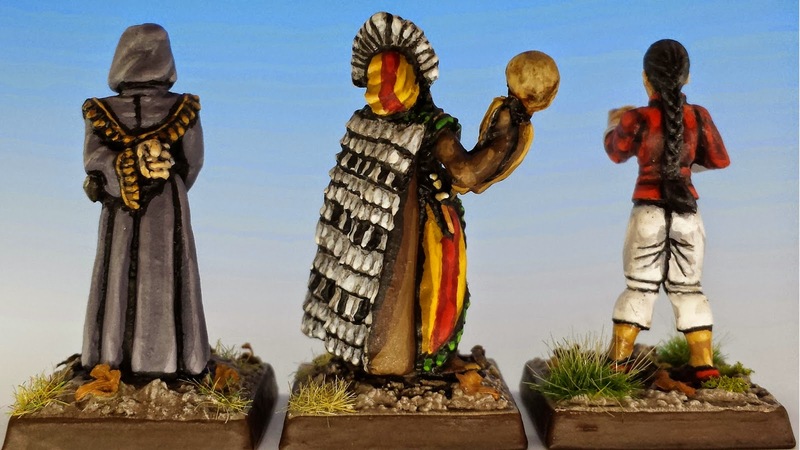 In the 1980's, miniature manufacturers didn't have the same zest for multiculturalism that pervades the modern gaming industry. 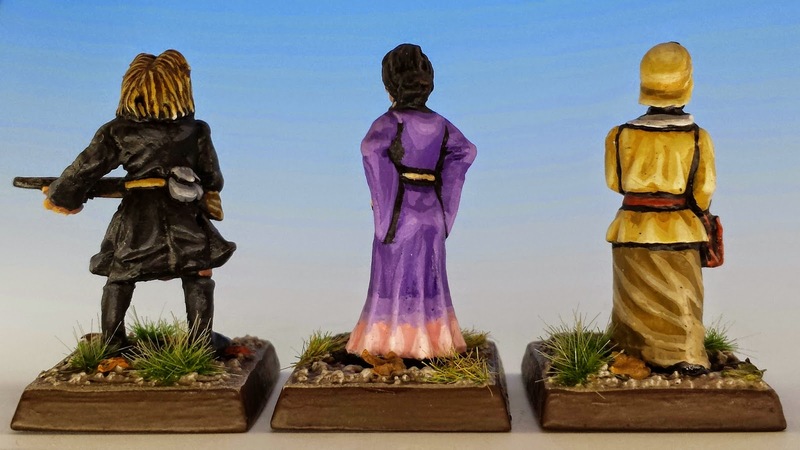 So I had to wander a little further afield to find suitable miniatures for some of the characters, especially the women. 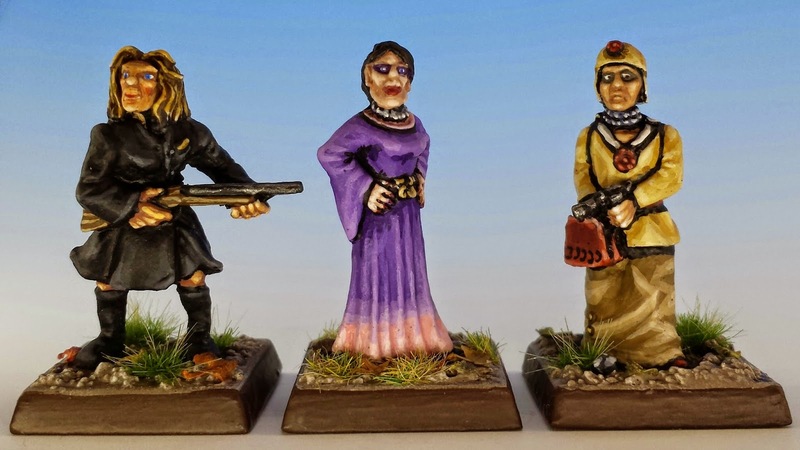 The shaman and cultist are preslotta minis from Citadel's underated C30 Amazon range. 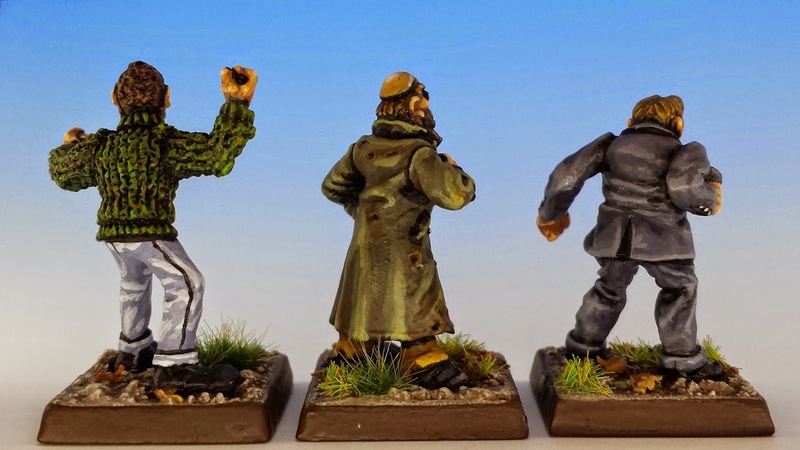 And the martial artist is a modern sculp by Kev White of Hasslefree Miniatures. (I adore Hasslefree's clean, simple sculpting style. It also offers a great range of female characters. Highly recommended). 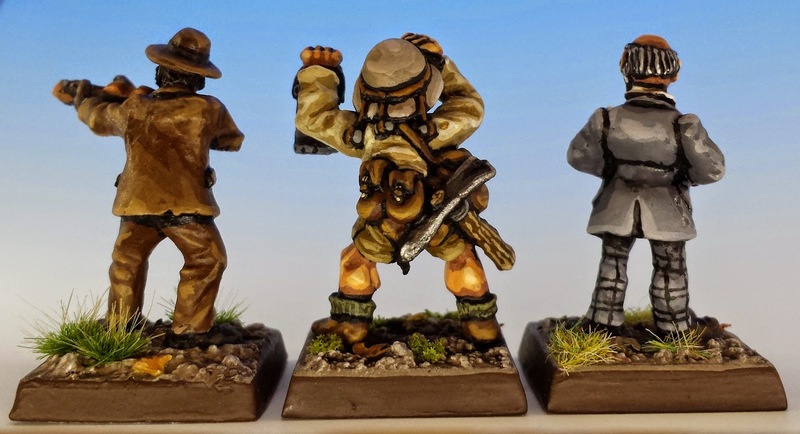 Another great source of Lovecraftian miniatures is Wargames Foundry. 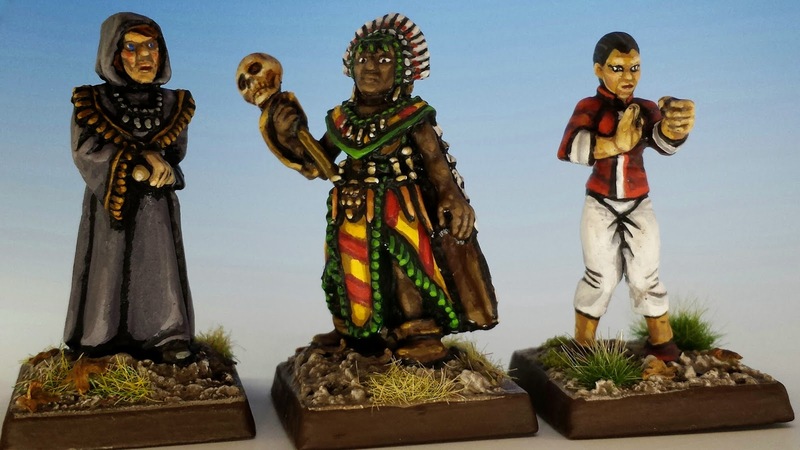 They don't have a dedicated Cthulhu range, but their huge and eclectic collection of miniatures offers many intriguing possibilities, including Tim Prow's Victorians, the Old West, British in Africa, and Egyptian Adventure (also by Tim Prow). Not only are they lovely, characterful sculptures in their own right, but they also harmonize nicely in scale and style with the Gothic Horror range. No surprise there, since Wargames Foundry is the true heir to the Citadel of the mid-1980's. I made a blog to comment on your Olderhammer blog! Iä!